Our website is since yesterday totally mobile accessible. We have made some changes which allows mobile device users to easily access and surf our website. 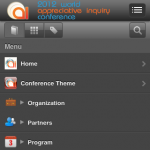 These changes were also made in the preparation of our 2012waic mobile application, which will be available by the conference. Later this week we’ll put more information about the program on the website. We will also update the partner page with more detailed and up-to-date information. So keep an eye on the website!